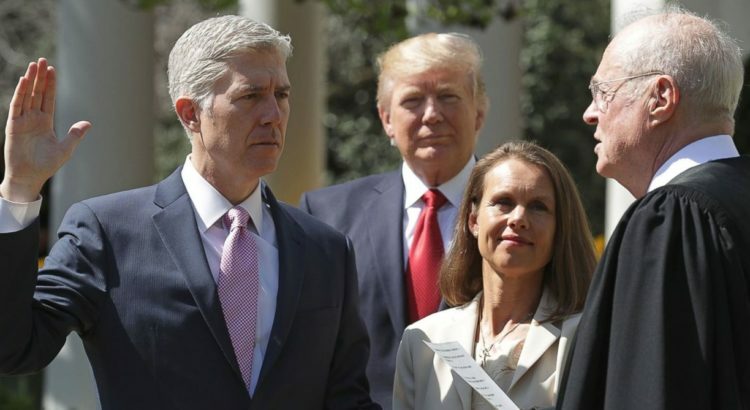 With the confirmation of Neal Gorsuch as the newest and ninth associate justice on the Supreme Court of the United States (SCOTUS), we are being repeatedly told in the media how this will tilt the court in a conservative direction. I’ve heard some commentators mention how some very high profile cases will now be decided on a 5-4 vote because Justice Gorsuch will now hold the deciding vote. I do not know how you feel or if you gave this any thought, but such commentary disturbs me greatly. Putting these two definitions together we have a crystal clear understanding of the job of a judge, and especially a justice of the SCOTUS: to administer the laws so that justice is done. Indeed, the picture of our judiciary is that of Justitia, the Roman goddess of Justice, who wears a blindfold and holds the scales of justice in her left hand. Her statue portrays how judges are to be impartial, blind to everything but the facts of the case before them so that they can render a just judgment. Yet, when we hear that such-and-such a case will now have a 5-4 vote outcome even before the case is heard belies everything I have just described. The import of what we hear in such statements is that these cases will be judged not on the merits of the facts of the case, but on the preconceived ideology of the justices. If this be true, then what purpose does the SCOTUS serve? Why should we believe that justice will prevail when the law is not justly administered? Would you want your case to be heard if you knew that the outcome had already been determined in the minds of those hearing it, based upon their ideological leanings? Hardly. So when I hear that we now will have a “conservative” court because of the ideology of five of the nine justices, and that we can now expect the court to rule this way or that way because of their ideologies, I am deeply dismayed. I am a conservative, constitutional originalist. Yes, I want their judgments to be in conformity with the Constitution’s original meaning and intent of its authors – not judicial precedent or “feelings” or ideologies of the justices – but most of all, I want, in the words of Bastiat – Justice.